See more objects with the color tan dimgrey darkslategrey or see all the colors for this object. This is a Drawing. It was designed by Henry Dreyfuss Associates. It is dated June 11, 1953 and we acquired it in 1993. Its medium is graphite, red color pencil on tracing paper. It is a part of the Drawings, Prints, and Graphic Design department. 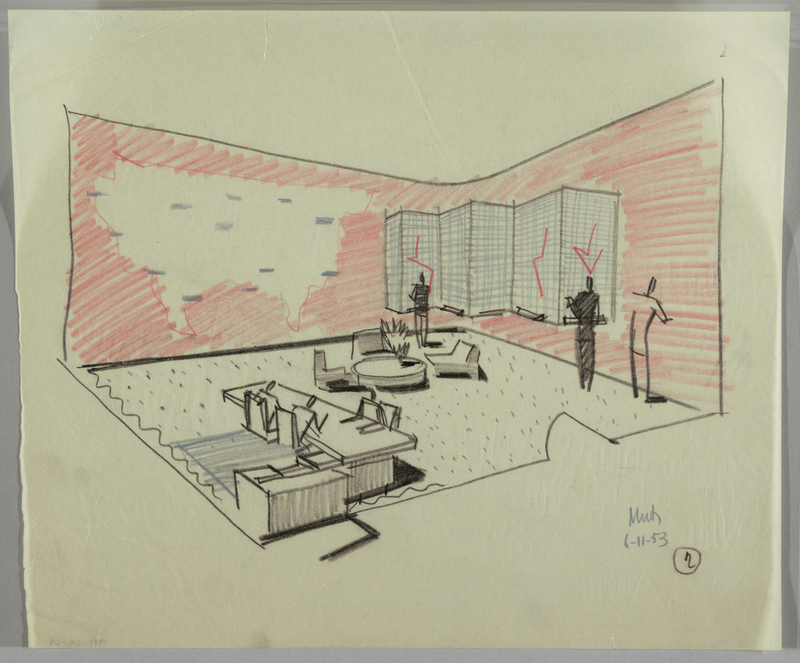 This is one of a group of drawings proposed for acquisition that document work by the Dreyfuss firm during the postwar years, for clients including Royal Typewriter (1944–45), New York Central Railroad (mid-1940s), RCA (1946–55), National Supply Co. (1949–58), and Cities Service (1951–62). 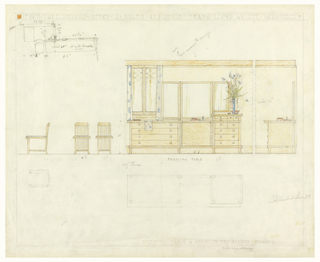 A number of the finished drawings correspond to prototypes or other documentation held in Cooper-Hewitt’s Dreyfuss archives, including those for RCA radio/phonograph and television consoles, and two beautiful drawings for Bell Telephone Laboratories of public phone booths. This object was featured in our Object of the Day series in a post titled A Hitchhiker’s Guide to America. It is credited Gift of John Bruce. graphite, color pencil on cream tracing paper.